1. 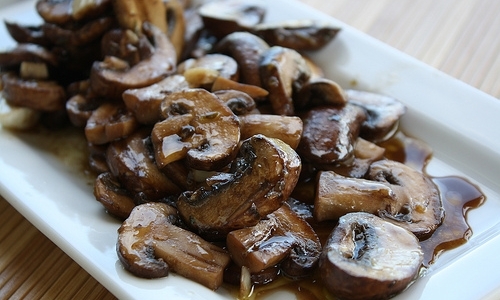 Chop mushrooms and garlic set aside. Heat vegetable oil in a large skillet over medium heat. Cook and stir mushrooms, garlic, soy sauce, red pepper flakes, and vegetable broth until mushrooms are browned slightly 6 minutes. Add in spinach, and reduce heat to low and simmer until mushrooms are tender, and spinach has cooked. Cook for seven minutes.